This is going to be the year I work through my unwanted and unloved fabric stash. In fact it, I'm blowing through it with not one but two scrap projects so far. I've gone from two totes to one and I couldn't be happier about that or happier about the scrappy quilts that are the result of scrap busting. The first one is a good old fashioned Drunkards Path quilt. I had these white sections from a previous Drunkard Path quilt in 2017 and instead of tossing them, I held on to them knowing full well I'd come up with a good way to use them. It may have taken a while, but you never know when an idea is going to come to mind. My daughter Britt has numerous boxes of 'treasures' stored in our basement. She was rummaging through some of boxes and came across this set of drunkard path templates which I quickly snatched up. One day they will come in handy I told myself! That day came! 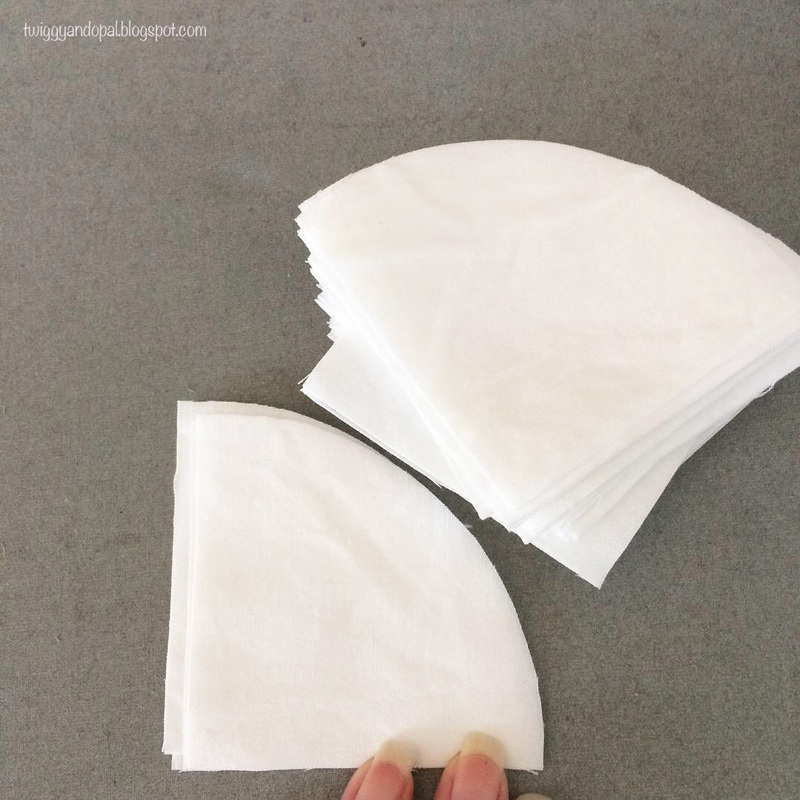 The dots were connected when I was cleaning my sewing room and found the templates, found the white scraps and put two and two together. The templates make 4" blocks and with a little trimming the white sections were ready for some scrappy action! Dragging out the unloved fabric totes, I started by making four blocks using the same print. The plan was to pair all four together for one large block and then piece the quilt together. That plan went out the window pretty quickly! I added more prints to the mix for a true scrappy mishmash concoction! I like to sew curves, but I always have issues with drunkard path blocks. They never come out perfect. With the blocks being 4", I took the time to glue first and then sew. It takes a lot more time and still they have to be trimmed. I ended up doing all of the work (glue, press, sew, trim) in the evenings. Look at that pile! I love a nicely trimmed and pressed stack of blocks! I trimmed the blocks to 4 1/4", threw them on the design wall, tweaked, turned and adjusted until it felt right. AND then the fun began?! It isn't easy getting the centers to line up perfectly, and truth be told, not all were. And you're welcome...you now have that song flowing through your mind, as do I! In order to increase the size of the quilt, I added a scrappy border around the outside. Once it's quilted I plan on using white for the binding. Another way I drastically decreased my stash of unloved fabrics was to use larger pieces of fabric for a lovely pieced back. I didn't take a picture, but once it's quilted you will most certainly get to see that. While I was on a scrap busting roll and all the fabric was out, I couldn't resist one more quilt. I quickly drafted a design using EQ8 and it should be a lovely flimsy by the end of the day. This my lovelies, is to be continued...stay tuned! 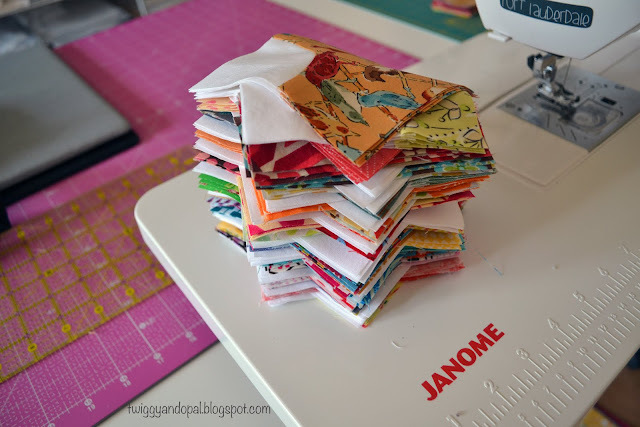 Okay, so let me just tell you that there is a GREAT WAY you can rid yourself of your ENTIRE stash of unloved fabrics in ONE FELL SWOOP... You can ship them to ME, because I LOVE your fabrics in this quilt! Second, I love what you did with the scraps and the leftover white circular bits. As for piecing the Drunkard's Paths, this is one of those situations where a GO! 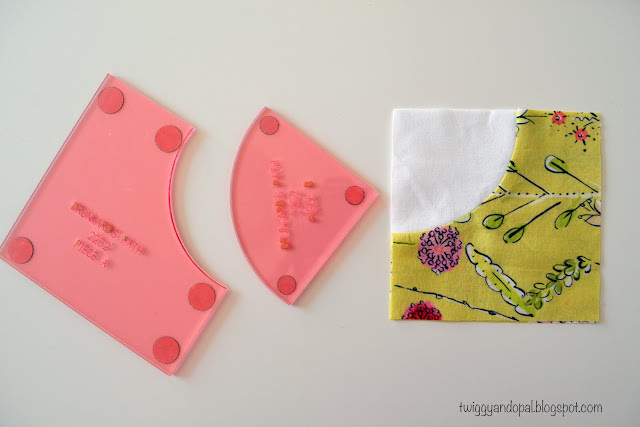 Baby cutter and Drunkard's Path die would be a Godsend, because not only would it cut out perfectly identical pieces four at a time from your scraps, but the dies are designed to make little notches on every inside and outside curve that you match up when piecing them together. 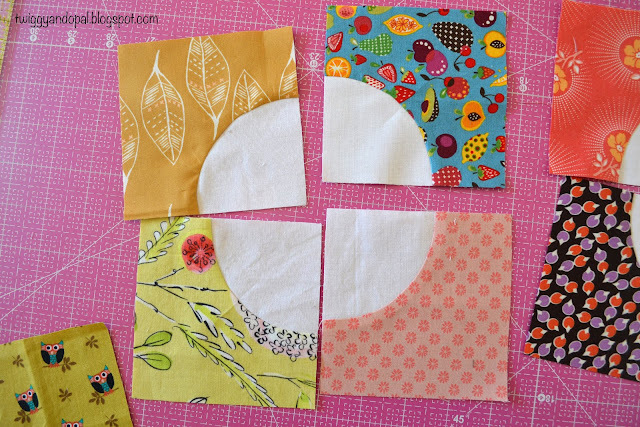 I am seriously crushing on your quilt, but as I don't have all the white curved pieces already precut like you did, I'm thinking about what if I just sewed 4 patch blocks together and then did a circle applique in the center of each one instead of all the curved piecing and having to match centers? If I used Harriet Hargrave's method of invisible machine applique I'd have turned edges and would be able to cut the 4-patch fabrics away behind the circles so the prints wouldn't show through... 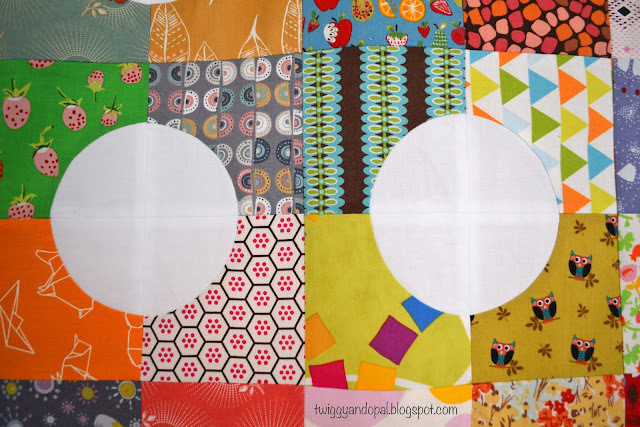 I've got a couple of babies needing quilts and a longarm machine that needs tops to practice on, so lately I'm on the lookout for cute quilt ideas that can be pieced faster than what I've done in the past. Thanks for the inspiration, and congratulations on turning your unloved scraps into such a beautiful quilt top! You are going to have so much fun quilting it!! I’m at the point where I want use older fabric that has been around for years. It isn’t that I hate it, I’m out of love with it! One thing about scrappy quilts like this, you can use anything…and it will look great! I’m anxious to quilt my DP quilt…in a week or so! I’ve been seriously considering some kind of Go Cutter lately, but the Drunkard Path die never crossed my mind. I love the notch idea! Yes, yes, yes to circle appliqué on four patch! I did something similar to that years ago and you should do it! It might even be better than the DP quilt! It makes me so happy that I might have inspired you to go for it! I can just imagine your creative juices are flowing now. Love this one and can't wait to see the next one! This is super duper! I love the look of the dots. I was going to say something supremely witty but Cheeky Cognoscenti aka Rebecca already beat me to it. OK, just the first part. Love the blocks and I am sure it will make a lovely quilt. It will some lucky person squeal in delight. I have to say that once the top was complete, I do love it! 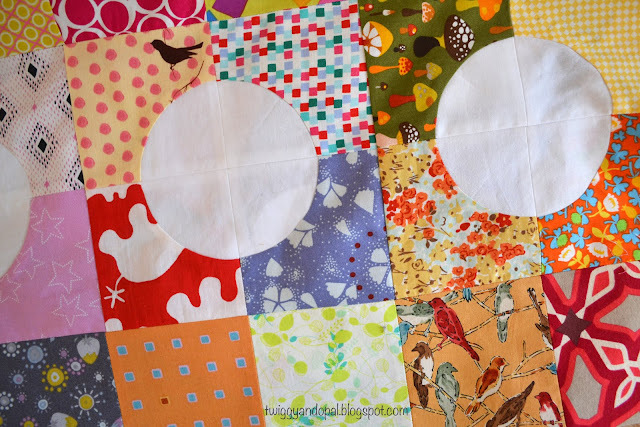 Scrappy quilts are great for making unloved fabric shine! I love how you say oh so casually, whilst I was at it, I started another quilt! It’s so true though! I tend to start one project and make one or two, sometimes three quilts with the original fabrics! Wow! Even your "unloved" prints are fun and happy and pretty! This scrap quilt is right up my alley. Can't wait to see what you created today! 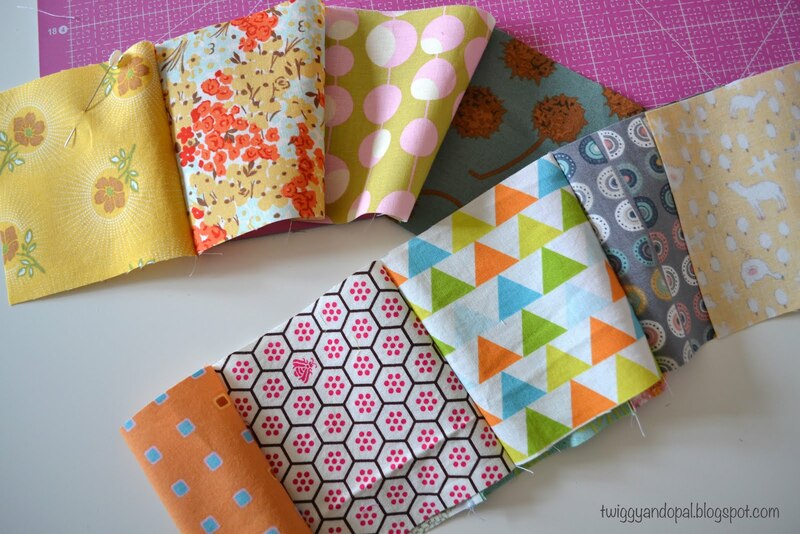 Scrappy quilts are my favorite, and your Drunkard's Path is so colorful & fun. I try and make scrappy backs for my quilts - almost makes two quilts in one. Great way to use up scraps. I've been enjoying sewing curves. I purchased a new pattern from Sew Kind of Wonderful so I can do some more. Clearly, you're very particular in what you love, 'cause most of those fabrics look fabulous. And likely they were at one point. What is amazing is how fabulous they look in that quilt, because it's a wonderful quilt, full of fun and whimsy. Congratulations! The sad news is that I'll never be able to pitch ugly fabric again, if I think of what you can do with it. I could send you a box? (no, international postage is too expensive). 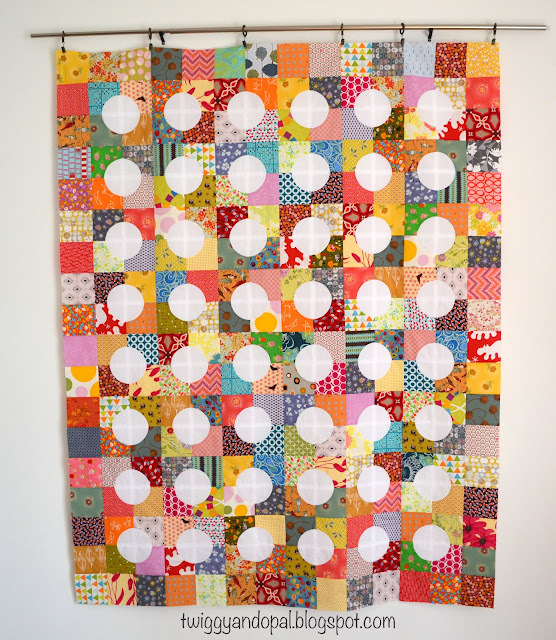 This quilt is so fun, Jayne - I love its bright happiness! Such a great idea to use up those leftover drunkard's path circles! 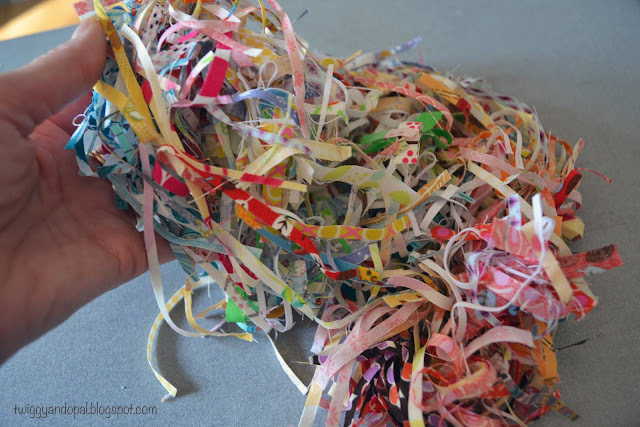 What a great way to use up those scraps, I love this! 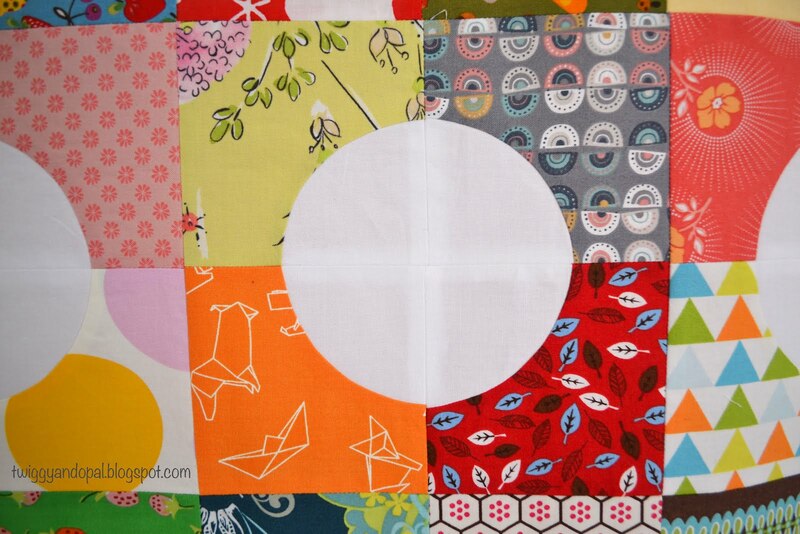 You know I can always cheer for a scrappy quilt from prints. The more the merrier! Thanks for sharing with Oh Scrap! I am looking forward to seeing what is next. I love how simple white circles provide enough structure to unite the great variety of scraps you used here. Well done!